The Airport Guide API allows you to Enrich your web site and email content, Enhance your services, and Build content-rich web sites. 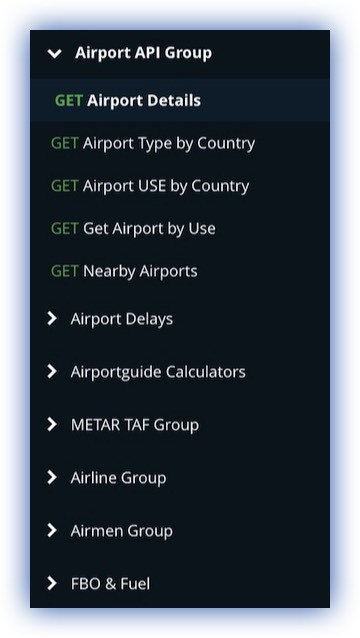 Whether you are a web developer, airport, or FBO, the Airport Guide API has data for you. Enchant your users with more in-depth content by providing them Airport Guide API data. Focus on your core content and let us fill it out with airport and airline data. Boost your story potential with search-engine friendly content to attract more followers. Enhance your service and increase customer engagement by offering extra added value to your inbound strategies. Some general airport and airline data services are shown. 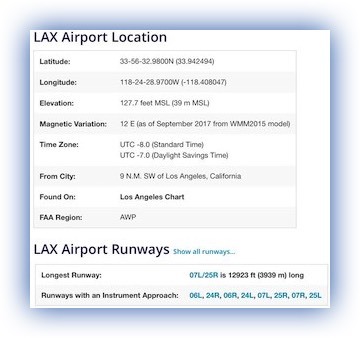 See the Airport Guide API documentation for a comprehensive listing of available data. Remember, if you don't see the data just ask us. We probably already have the data and can create a new API within days. What airports are in a certain country? What time does the sun rise and set at a location? What are the latest METAR and TAF weather for my area? What are the airline codes and call signs? Who uses the Airport Guide APIs? Integrate Airport Guide data, content and services into a wide variety of application environments. Provide airport data directly to pilots and travelers from your site or mobile app. Enhance your travel content with airport, airline, and weather data. Try the Airport Guide API? Don't let the moment pass you by! Roll up your sleeves and create something amazing.